If you see gum on the street, leave it there. It is not free candy! I missed A to Z Monday last week... but I squeezed my "F" is for family up there on the nice list! Skip on over to Jen's Unglazed for some more "E" fun! Oh how I love this post. Would you believe that I thought of ELF for today too...it is one of my favorite movies too. I always laugh...I just love the happy feeling it gives me. Except for the gum thing...ugghhhh. Great photos, looks like someone is getting in the Christmas mood!!! I like the way Buddy thinks!!! Thank you for making my day!! Love your displays!!! Enchanting! Have a great week! oh yes! Elf! We watched it Thanksgiving night as well. I love, love, love it! i could list my favorite lines here...but it would a post unto itself. Great Christmas advice Dawn and Buddy! We need more Buddies in the world. Such a great movie. I love all your pretty, festive photos also. My E post is up but blogger did not update it for some reason. Hope you'll stop and visit! I love getting ready for Christmas, and our favorite movie is ELF, too! Elf is a funny movie.I've only seen it once, but my friend's daughter watches it all season long. I like your pictures. The dessert table looks good! 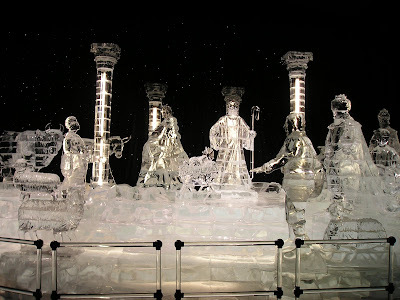 And the ice sculptures are beautiful. Elf is great! 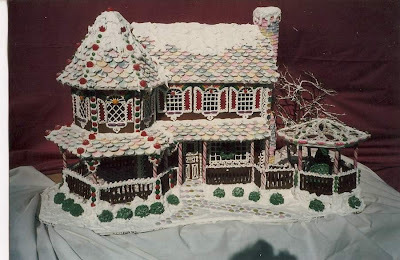 and that gingerbread house--wow! beautiful family picture! and what cute kids and a pretty tree! hope you had a gREAT monday! !!! I just saw Elf for the first time on Saturday--I loved it! An instant Christmas classic for me! What a great list of Christmas wonderfulness : ) I just loved every part of it!